Aurelie Bidermann, brand, is the story of a woman, a dreamer, lover of travel and nature. For nearly ten years, Aurelie jewelry created in his image, she, a woman of rich experiences and a soul that dances to the beat of his adventures makes her desired pieces in an aura of luxury and romance. Today, we review his latest collection, marked by ethnic symbols and the air inspired by the west. Contemporary pieces, created to be used according to moods. 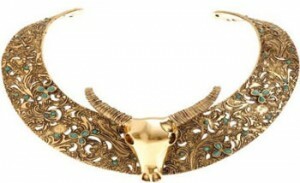 The bulls, gold and turquoise are the basis of these jewels that become must-haves of a great sensitivity for the slide.